[By Dave Holmes] A conference on the Rojava Revolution will be held as the struggle in northern Syria enters perhaps its most critical phase. The Rojava Revolution in Northern Syria: An experiment in radical democracy, feminism & ecology is the title of a conference to be held in Melbourne on Friday, June 30 and Saturday, July 1. The event aims to inform participants about the revolutionary process, to discuss the problems it faces and to build support for it. For six years Syria has been engulfed in a terrible war. The original democratic revolt against the Assad regime has given way to a brutal multi-sided conflict. But in the midst of this carnage, under threat on all sides, the freedom struggle in Rojava is an inspiring beacon of hope. Initially a struggle for Kurdish self-determination, the liberation forces have established the Democratic Federal System of Northern Syria as a model for a multi-ethnic, federal and socially just Syria. Today in northern Syria, a radical commune-style democracy is being constructed. Unprecedented efforts are being made to empower women. A new society is being created where all the various ethnic and religious groups that form the incredibly rich Syrian social mosaic can live together in peace and cooperation. The assault on the Islamic State stronghold of Raqqa by the Syrian Democratic Forces, backed by the United States, is clearly approaching its climax. All the various players are jockeying for position and preparing for the aftermath. IS strength is declining but the fundamentalist group is unlikely to disappear any time soon. And the equally Islamist, fundamentalist Al Qaeda affiliate (it has gone through several name changes) has actually been strengthening its position. The Assad regime, with heavy Russian and Iranian backing, has been regaining control of many areas but has been terribly weakened by the long war. Obviously it does not want to see a radical democracy in northern Syria or anywhere else. Turkey, ruled by the Kurdophobic regime of dictator Recep Tayyip Erdogan, continues to make cross-border military attacks to target the liberation forces. By patrolling the border, the US has sought to discourage Turkey but will it continue to do this once the IS is reduced to a guerrilla nuisance? Washington’s support for the SDF, and particularly for the Kurdish forces who are the biggest single part of the SDF, is purely tactical and will only last as along as the IS is a serious threat. The US has absolutely no interest in backing a revolutionary process in the region. A great deal depends on the alliance between the Kurdish and Arab communities. 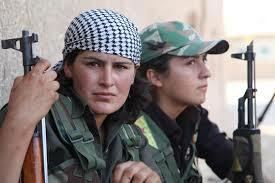 As the battle for Raqqa nears its decisive phase, more and more Arab units are joining with the Kurdish People’s Protection Units/ Women’s Protection Units (YPG/YPJ) in the SDF which is clearly a mass multi-ethnic, non-sectarian force. More Arab communities, including Arab women, are being drawn into the grassroots democratic structures that are being set up in the areas liberated from the IS. Saleh Muslim is a founder of the Democratic Union Party (PYD), the leading party in Syrian Kurdistan, and today is one of the two co-chairpeople of the organisation. He travels extensively representing the Democratic Federation of Northern Syria. A chemical engineer by training, he has a long involvement in the struggle for Kurdish rights. Hawzhin Azeez came to Australia as a Kurdish refugee from Iraq at the age of 11, lived in Western Sydney and went on to lecture in politics at Newcastle University. Today she is an activist with the Kobanê Reconstruction Board, based in the city. Azeez has contributed articles on Rojava to the online journal Kurdish Question. Ercan Ayboga is an environmental engineer and activist currently based in Germany. Formerly he worked in the city administration of Diyarbakir (Amed) where he was the coordinator of international relations and heritage sites, including the urban Tigris River project. Ayboga is a co-author of the book Revolution in Rojava: Democratic Autonomy and Women’s Liberation is Syrian Kurdistan. The conference is being hosted by the Victoria University College of Arts and Education and organised by Honorary Professor John Tully with the assistance of the Kurdish Democratic Community Centre of Victoria and Australians for Kurdistan. The conference will be held at Victoria University’s City Campus at 300 Flinders Street, Melbourne. Tickets may be purchased from https://www.trybooking.com/PWTZ. For the draft agenda, see the conference page on this website. This entry was posted in Uncategorized by AFK. Bookmark the permalink.